If you’re a thirty-something year old gamer like myself, it’s likely that you have fond memories of a game series called Road Rash. Developed and published by Electronic Arts from 1991 through to 2000 (apart from 1999’s Road Rash 64 which was developed and published by THQ), the Road Rash series provided point-to-point motorcycle races with a difference; you could violently attack other racers to ruin their day. Peaking with the CD version of the first title, which was released on numerous formats including the Sony PlayStation and SEGA Saturn, the series had its up and downs but on the whole it was a great deal of fun. After Road Rash: Jailbreak however, released on PlayStation in 2000 before being ported to Game Boy Advance in 2003, the series has been absent from the gaming world. Numerous sequels and spiritual successors have been mulled over during the years but none have ever really come to fruition. Until now. 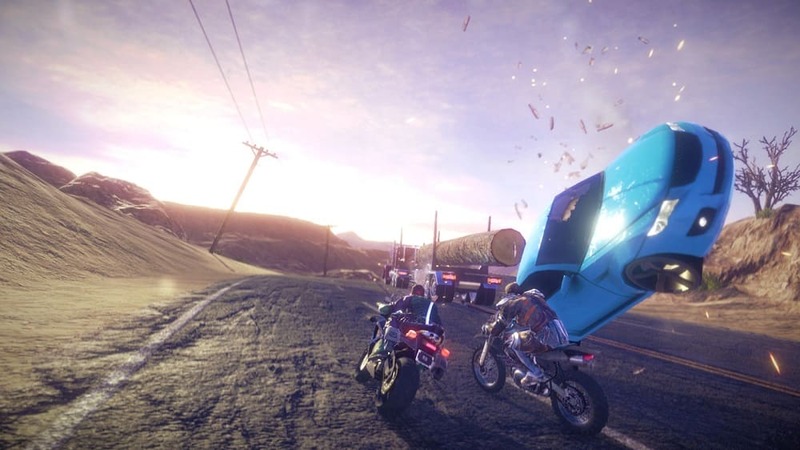 Road Redemption is the Road Rash successor that fans have been waiting for, capturing the very essence of the much-loved series and bringing it violently up to date. Announced way back in 2013 alongside a Kickstarter campaign, Road Redemption may have been over four years in the making, but it was sure worth the wait. The core of the game remains very faithful to the Road Rash experience: you race point-to-point through a variety of environments including American highways, and along the way you’re encouraged to partake in acts of brutality to increase your chances of victory. Of course though, being a game released in 2017, there’s more to it than that. The action is propelled forward by a narrative, though while its characters are enjoyably larger than life I’ll admit I’ve paid little attention to it. Instead, I’ve been in too much of a hurry to just actually get into the action and carry on my career of speeding and maiming. Before each event you’re given an objective; it might be as simple as crossing the finish line first, or it could be to wipe out a set number of rival gang members hell-bent on putting an end to your progress. Every once in a while you might have to take on a boss too, which proves to be quite a challenge when you’re also being hounded by a swarm of minions. To deal with other racers you’ve got quite a range of options. Generally speaking you’ll only start out with a short range blunt melee weapon which you can recklessly swing to either side to knock off riders helmets or wipe them out completely completely. You can always land a swift kick on an opponent’s bike too, forcing them into traffic or off the road. As you progress, however, you’ll also gain access to bladed weapons, explosives and assault rifles too, which you can switch between with the simple press of a button. By completing objectives and battering opponents you’re awarded cash, which can be used between events to restore health, upgrade weapons and provide other useful benefits, though when you die, and it’s bound to happen eventually, you lose them all. 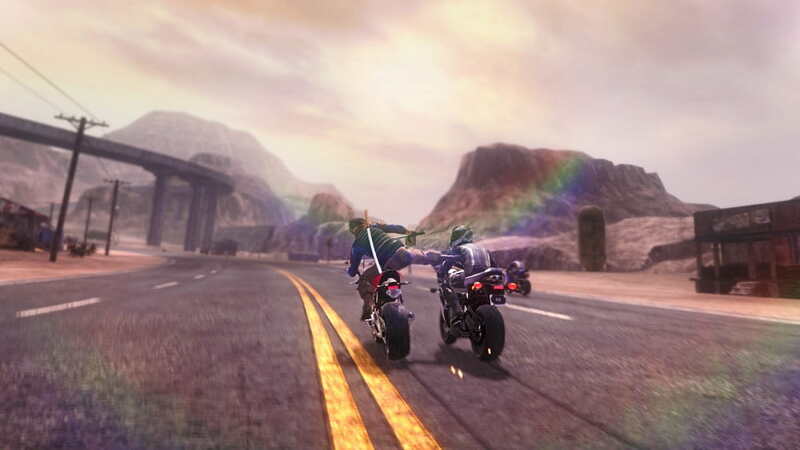 You see, Road Redemption has rogue-like elements, which means every time you die you’re taken back to the start of the game, or at the least the beginning of the area you’ve reached. You are given a bit of a lifeline by being able to spend XP on a wide range of permanent upgrades and perks at the end of each run. 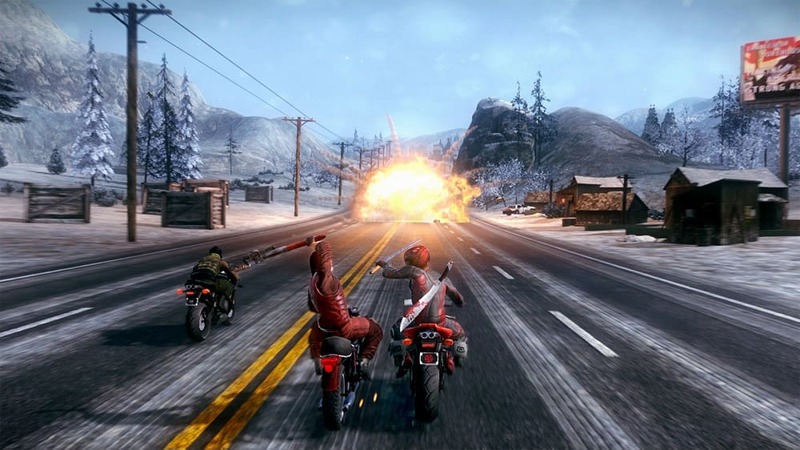 While Road Redemption may feel very challenging at the outset, over time, you become a force to be reckoned with, while also gaining access to a decent range of bikes and riders that have their own stats. It’s the type of game that you’ll keep returning to, ever developing your abilities which allows to steadily progress further into the game and unlock new content. And the gameplay has the addictiveness to make it always a pleasure to do so. Those who do stick with the game through to its completion will find themselves unlocking a Campaign+ mode for even more fun, while those who want to play without any modern-day trappings can jump into a classic quickplay mode which strips back some features. There’s even support for split-screen multiplayer for up to four players, as well as the ability to play online. For its £14.99 price tag, Road Redemption packs in a considerable amount of content and features that will not disappoint. Honestly, if you’re a fan of Road Rash you really must check Road Redemption out. Fast, brutal and huge amounts of fun, it hits all the right notes to make it an unmissable slice of arcade racing with an abundance of combat. It looks nice, has a rocking soundtrack and a surprising amount of depth. A Road Rash fan really couldn’t ask for more. What is the Xbox One X really capable of: Hands-on with 10 Xbox One X games. Want to Unlock a Single Hero in Star Wars Battlefront II? Game the Full Weekend Without Sleep!